Hanoi (VNA) – A special envoy of President Tran Dai Quang, who is Chairman of the Presidential Office-Minister Dao Viet Trung, joined leaders and officials from 103 countries at the inauguration ceremony of Iranian President Hassan Rouhani from August 5-6. On the occasion, the Vietnamese official held meetings with Iranian Minister of Industry, Mine and Trade Mohammad Reza Nematzadeh and Deputy Minister of Foreign Affairs Ebrahim Rahimpour. The special envoy expressed his belief that under the leadership of Iran’s supreme leader Ali Khamenei and President Rouhani, the Iranian Government and people will reap more achievements during the cause of national construction and development. Trung said he is certain that the traditional relations and multi-faceted cooperation between Vietnam and Iran will further develop in the coming time. 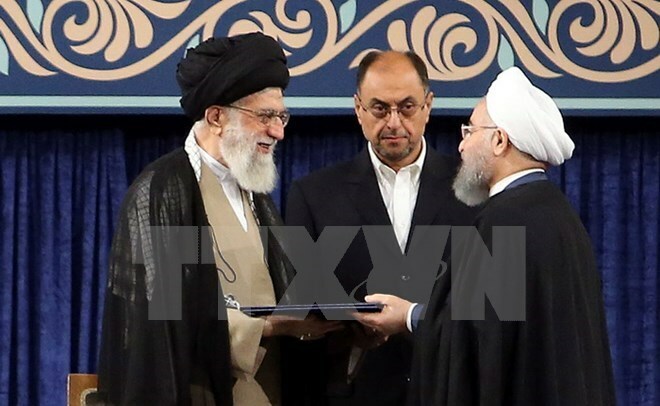 Meanwhile, the Iranian officials thanked Vietnam for sending a special envoy to President Rouhani’s inauguration ceremony. Commitments of the two countries’ leaders as well as rosy results of the 9th meeting of Iran-Vietnam Joint Committee in July will help the two countries realise the target of 2 billion USD in bilateral trade revenue soon, they said. The two sides also affirmed to continue cooperation and mutual support at international and regional forums.